Yes, I am still in Maui. Yes, I know you are tired of hearing that. Also, we're trying some different formatting with the Take Note section. Let me know what you think at ina@axios.com or just by hitting reply to this newsletter. Apple released its list of top free iPhone apps for the year and, once again, the list was dominated by titles created by Facebook, Google and Snap. 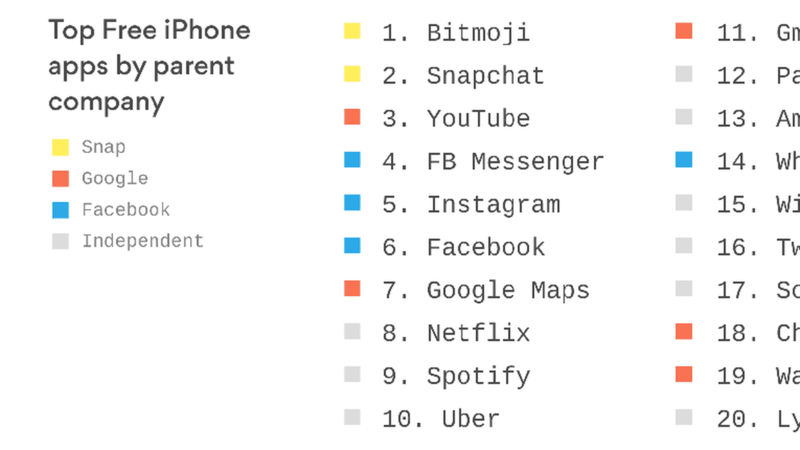 Their apps, which combined led the top seven spots, were followed by Netflix, Spotify and Uber. Why it matters: These companies dominate the share of ad spending so it's vital to their future to have top-ranked mobile apps as well. On the other hand, it's getting harder and harder for others to find their way to the top of the charts. Apple also released its Top 20 for other categories, including: paid apps, free and paid games, music, movie, TV shows and books. Read more: You can see all the Top 20 charts in this story. Qualcomm unveiled details on its next-generation cellphone chip Wednesday and a couple of the features seem tailor-made to helping Android rivals take on the iPhone. Face ID — Qualcomm didn't name the Apple authentication method by name, of course, but did talk about using 3D depth-mapped face images as a means of authentication, so expect to see this on high-end Android devices in 2018. Single camera portrait mode — this has already shown up on Google's Pixel 2, but with Qualcomm building chip-level support that means it should also appear in a wide range of devices next year. Why it matters: For all the criticism from regulators and rivals, Qualcomm continues to put the building blocks into its chips that are needed to allow even small smartphone makers to issue high-end phones to rival the biggest names in the market. ​Protectionist policies may be causing data "fragmentation"
The internet may be global, but regulation of it is local. That's driving increasing "data fragmentation" that is becoming a threat to global business, Accenture says in a new report. The number of restrictive trade measures adopted by G20 members has quadrupled since 2010. The number of countries with data privacy laws has tripled since 1995. 91% of the CTOs surveyed say increasing barriers to digital trade will raise IT costs over the next 3 years. The takeaway: Borders matter more than ever as international rules are developed to govern how data — the "gold" of the digital age — cross between countries. These policies are usually created with good intentions, like strengthening privacy and security. The tech industry argues that's why broad global trade agreements are needed to set a standard for how data is stored and shared around the world. The battle for smart speakers is raging on various levels. Axios' Chris Matthews has a piece looking a some of the dynamics, including just how much voice recognition on a speaker could disrupt the retail business. Industry moves: Amazon, of course, is looking to grab a greater share of retail spending with its array of Echo speakers and Alexa-powered devices. That leaves Google as a surprising potential white knight for big retail. The company has already linked up with Walmart, but there could be room for one or two other partners. For those that don't strike a deal with Walmart, Apple and Microsoft could be options, though it's unclear just how far either company is looking to go in this space. Speaking of smart speakers, Qualcomm showed off a reference design for a speaker using its next high-end phone chip, the Snapdragon 845. That should allow even more players to get into the game with quality gear. Fortune's Global Forum is taking place in Guangzhou, China. Uber's top dealmaker in Europe, Fraser Robinson, is stepping down, according to the Financial Times. Wikipedia co-founder Larry Sanger is joining rival Everipedia as CIO, per Wired. Pokémon Go is adding new monsters and incorporating real-world weather into the game, the Verge reports. The maker of popular mobile trivia app HQ is looking to fundraise in a round that could value the company at $100 million, per Recode. CNET says HQ is also coming to Android on Dec. 25. Lyft is doing a self-driving car pilot in Boston in partnership with NuTonomy, per the Verge. Quartz did a story on how broadband access still costs way too much in Africa, in many cases more than the monthly minimum wage salary. These eyeglass frames are made from old record albums. Cool.